Home Styles Cuisine Kitchen Cart in a white with a black granite top features solid wood construction, and Utility drawer; 2 cabinet doors open to storage with adjustable shelf inside; Handy spice rack, Towel bar; Heavy duty locking rubber casters for easy mobility & safety. Size: 32.5w 18.75d 35.5h. Home Styles Monarch kitchen island and two stools are constructed of solid and engineered hardwoods in a finish. The Monarch kitchen Island features a rich black finish with a distressed oak veneer profiled top for an aged look with a granite insert. Features include a turned sliding column post to maximize space, doors that open to storage with two adjustable shelves behind each door, and two utility drawers for added storage. Size: 46w 25d 36h (with leg extension size is 46w 40.5d 36h) Stools features a slight arc diamond pattern of the back to the tapered legs, and black leather seat and 360 degree swivel. The seat height measures 24h and arm height measures 31.75h from the floor. The embodiment of elegance, the Colonial Classics Collection by Home Styles provides a sophisticated retreat. Creating the kitchen of your dreams with beautiful craftsmanship such as poplar solids and cherry veneers, impressive picture frame moldings, and turned bun feet. Physically distressed using techniques such as worm holes and season splits adding further interest and character to this collection. Accessorized with antique pewter finished hardware and a cultured dark cherry finish. The Kitchen Island features a split top with .75 inch black galaxy granite, six storage drawers with side-mounted metal guides, two cabinet storage doors with adjustable shelves, and drop leaf breakfast bar. Breakfast bar extended top depth measures 37 inches. Finish and measurements may vary slightly. Assembly required. Size: 48w 25d 36h. The Country Comfort collection by Home Styles encompasses a traditional design while projecting a well-bred sophistication. The quality is manifested in the poplar solids and mahogany veneers. The Country Comfort collection is perfected with an aged bourbon finish and cup pull antiqued brass hardware accents. The kitchen island features speckled black split granite top, one cabinet with an adjustable shelf, one storage drawer with side-mounted metal guides, two open shelves (one adjustable), and breakfast bar. The patented sliding mechanism provides easy mobility and independent movement of the two legs for the extension of the breakfast bar. The breakfast bar extends the surface from 25 inches to 36.25 inches. Please note finish and measurements may vary slightly. Assembly required. Size: 48x25x36. U.S. Patented. 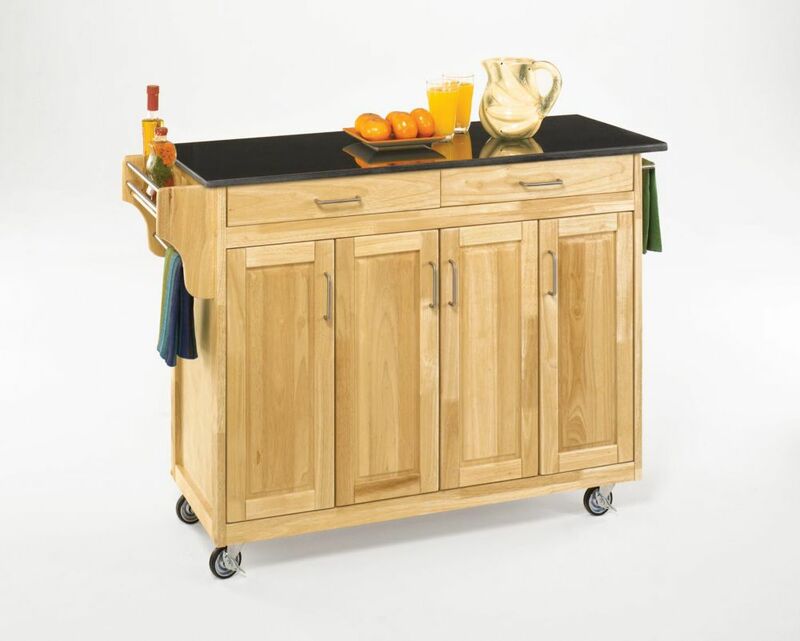 Create-a-Cart Natural Finish Black Granite Top is rated 4.4 out of 5 by 7. Rated 5 out of 5 by Linda from The cart is very useful and just the right size... The cart is very useful and just the right size for putting in the kitchen for an extra cabinet for storage. I got it to use as a storage cabinet and to put my new Ninja Foodi Pressure Cooker. The granite top works great for hot pots or dishes. Rated 5 out of 5 by HomeDepotCustomer from It was easy to put together and looks great in... It was easy to put together and looks great in my kitchen. Rated 4 out of 5 by Bryan from Love the cart. Just the drawers are way 2 shallow.... Love the cart. Just the drawers are way 2 shallow. Rated 5 out of 5 by Javier from With help took about 2 hours to create. Nice as... With help took about 2 hours to create. Nice as it looks. Perfect! Rated 3 out of 5 by Nadia from Looks nice but poor quality The cart is nice and fits well in our kitchen. The pieces do not align very well making it more difficult to ensemble. One of them even had a defect on it (a dent/deep scratch). The granite top gets stained easily. Also, the wheels do not lock steadily.